HONOLULU ― Officials on Thursday alerted people on the island of Hawaii about the rising levels of toxic gas in the air due to Kilauea volcano’s week-long eruptions. The alert, sent via text message, said that residents should be aware of higher levels of sulfur dioxide due to decreasing trade winds. “Residents are advised to monitor their sensitivity to increased levels of SO2,” Hawaii County officials said. Hundreds of residents on the island of Hawaii have been living in devastating limbo as the shield volcano continues to break open with new fissures. Recent eruptions have already claimed homes and displaced families. Activity on the volcano can be unpredictable, though things were relatively quiet on Thursday. HVO confirmed hazardous fumes continue but no volcanic activity. Cmty mtg tonight at 5:30pm, Pahoa High Cafe. ASL interpreter onsite. The lava has overtaken more than 100 acres and destroyed at least three dozen structures in the Puna district of the Big Island. Some 1,700 residents from Leilani Estates and Lanipuna Gardens, subdivisions in Puna, have been forced to evacuate because of the unpredictable eruptions and deadly gases. The latest fissure to open on Wednesday afternoon raised concerns because the vent is “a couple hundred yards” from a geothermal power plant, which contains thousands of gallons of pentane, a flammable liquid, Gov. David Ige said at a news conference. The facility has been shut down as workers move the pentane to a safer location and secure the geothermal wells, which can’t be moved, to prevent it from blowing out. “It is certainly heartbreaking to see the homes and the families who have lost everything,” the governor told Hawaii News Now on Tuesday. The Hawaii County Civil Defense Agency has warned people to stay away from the affected areas. Residents are only allowed to enter to check on their properties and remove belongings. Here’s everything we know about the ongoing eruptions on Kilauea volcano. More than two dozen fissures ― vents that are formed when the earth’s surface cracks ― have opened up and erupted with lava over the past week, covering roads, residential neighborhoods and forested areas atop Kilauea volcano. So far, 15 fissures have opened. Scientists believe more fissures and eruptions are likely and can occur at any time. Once a fissure forms, it emits hot steam and toxic gases before spewing fountains of lava that can reach hundreds of feet into the air. Activity at the newly opened fissures typically lasts for a few hours before “shutting off,” according to the U.S. Geological Survey’s Hawaiian Volcano Observatory. Toxic gases, however, can continue to spew even after the lava has ceased. As trade winds die down in the area, sulfur dioxide levels can increase. Most of the fissures have opened in Leilani Estates and also threaten the neighboring smaller subdivision of Lanipuna Gardens. Both neighborhoods are located on the volcano’s east rift zone, an area where splits are occurring. A lava flow moves on Makamae Street after an eruption on Sunday. Lava has covered an estimated 116 and a half acres of land since the eruptions started last week. As of Wednesday afternoon, at least 36 structures, including 27 homes, had been destroyed by the lava. No injuries related to the eruptions have been reported. Footage of the affected areas taken over the past few days shows the splattering lava setting trees ablaze and overtaking entire roads. Slow-moving walls of lava have consumed cars and crept through neighborhoods, burning down homes. Most of the eruptions have taken place within Leilani Estates, but a 15th fissure opened up near the entrance to Lanipuna Gardens. The lava flows and subsequent fires have damaged numerous roads. Officials estimate Leilani Estates and Lanipuna Gardens have about 800 structures, Hawaii News Now reported. Kilauea volcano, considered one of the most active volcanoes on earth, has been continuously erupting since 1983. While it has periods of relatively quiet volcanic activity, Kilauea has also had notable lava flows in the past. These recent eruptions intensified in early May, after the floor of Kilauea volcano’s Pu‘u ‘O‘o vent collapsed during an increase in earthquakes in the area. The crater floor’s collapse released pressure within the vent, sending an “intrusion” of rising magma toward the east rift zone. Intrusions can cause ground fractures and deform the surface of the ground, which residents have observed as cracks in the asphalt of roads and driveways. 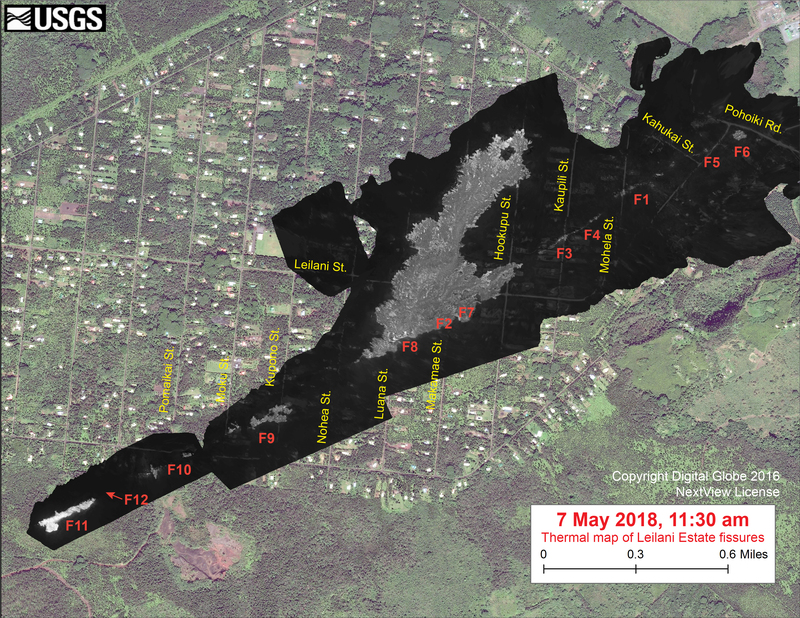 The first outbreak of lava occurred in a fissure in Leilani Estates on May 3 and lasted for about two hours. The lava spread less than 33 feet from the fissure and ended around 6:30 p.m. Three more had opened by the next morning. “The vents and the activity are unpredictable in the area,” Ige said on Wednesday, after a 15th fissure opened up in the Lanipuna Gardens subdivision. Lava spews from a fissure in Leilani Estates on Friday. Gov. Ige on Wednesday said the Puna Geothermal Venture (PGV) power plant is in a path where fissures may potentially form. Geothermal power plants, like PGV, convert energy into electricity using geothermal steam produced from reservoirs of hot water found miles below the Earth’s surface, according to the U.S. Department of Energy. “If you predict the line where the fissures are occurring, the PGV facility is on that line,” Ige said at Wednesday’s news conference. There are an estimated 50,000 gallons of pentane, an extremely flammable liquid, stored at PGV’s facility. On Wednesday, Ige also issued a supplemental emergency proclamation that gives the governor’s office more authority to protect the public from any damage facing the power plant. Ige ordered PGV to move the pentane from the facility to an off-site location. Diverting possible lava flows from the power plant is not an option. The level of volcanic activity in the east rift zone continues to change moment to moment, with fissures opening without warning. “Near-vent areas could erupt or collapse without warning, ejecting spatter and/or ash that can be carried downwind within the gas plume,” USGS’s Hawaiian Volcano Observatory warns. Aside from the dangers of 2,000-degree lava, fissures are emitting toxic gases into the air even after they’ve ceased to spew lava. Thanks to the ongoing eruptions, there are elevated levels of sulfur dioxide in the areas surrounding the new fissures. Volcanic gases can irritate the eyes, skin and respiratory system, making it extremely difficult to breathe. During a community meeting Tuesday, the governor said at least 75 members of the National Guard are on the Big Island assisting county officials in the affected areas. He also said he has reached out to the Federal Emergency Management Agency and the White House for assistance. Officials continue to warn residents to be on alert. U.S. Army National Guard 1st Lt. Aaron Hew Len takes measurements for sulfur dioxide gas at volcanic fissures in Leilani Estates on Tuesday. Ige signed a Presidential Disaster Declaration request on Wednesday, asking Trump to declare the state of Hawaii as a major disaster area due to the eruptions. Ige’s office estimated it would cost the state more than $2.9 million to protect the islands’ residents over the next 30 days, not including damages sustained from earthquakes caused by the volcano. “Costs will skyrocket should large-scale air and sea evacuations become necessary,” the governor’s office said in a news release. Ige is requesting federal help to deal with the devastation. Specifically, Ige is asking for the administration to give Hawaii access to the Public Assistance Grant Program and the Hazard Mitigation Grant Program. “As more fissures open and toxic gas exposure increases, the potential of a larger-scale evacuation increases. A mass evacuation of the lower Puna District would be beyond current county and state capabilities, and would quickly overwhelm our collective resources,” Ige said. The White House had not made an official statement on Hawaii’s lava flows as of Wednesday evening. However, Trump on Tuesday had signed a disaster declaration for the state of Hawaii for the historic flooding and landslides that occurred on the island of Kauai in mid-April.